Close to 300 K through 12 students from Madera, Fresno and Tulare Counties will now have the opportunity to attend after-school STEM (Science, Technology, Engineering & Math) classes thanks to a $25,000 Comcast grant. Called the Get on the Tech Bus program, it provides after-school STEM exposure to students through hands-on activities incorporating 21st century learning skills. The program was created from a collaboration between Self-Help Enterprises, the Tulare County Office of Education/CHOICES, and ImagineU Children’s Museum. From left to right: Joshua Simes, Area Vice President at Comcast; Tom Collishaw, President & CEO of Self-Help Enterprises; and Misael Carrero, Director of Sales & Marketing at Comcast. 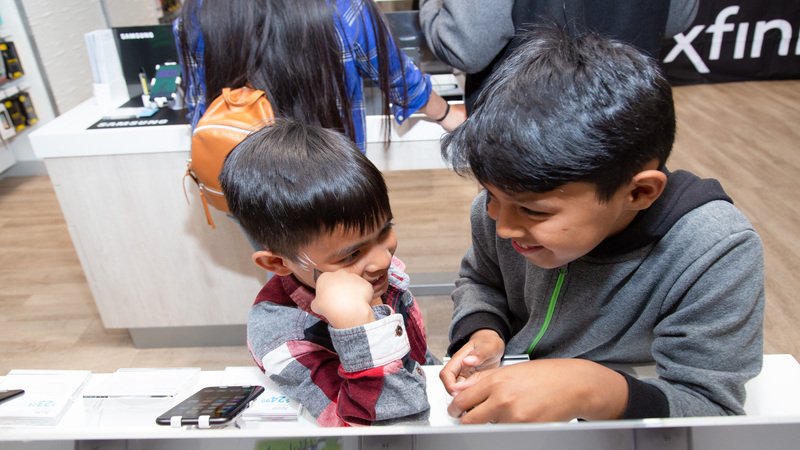 Last week, during the grand opening of the new Xfinity store in Visalia, students and their families received the news along with Tom Collishaw, President and CEO of Self-Help Enterprises, a non-profit dedicated to building and sustaining healthy homes and communities. “There is a need for this important learning to counter the growing gap between the technological skills needed in the workforce and the school district’s struggle to offer engaging STEM curriculum. At Self-Help Enterprises, we believe that every dream starts with an opportunity and the Get on the Tech Bus program will provide hundreds of students from the Central Valley with an opportunity to better their lives,” said Collishaw. Several leaders from the local community attended the celebration at the Xfinity store including Kuyler Crocker, Chairman at the Tulare County Board of Supervisors; Gil Jaramillo, CEO of the Tulare Kings Hispanic Chamber of Commerce and Jon Bueno, Director of Partnership Development at the Visalia Chamber of Commerce. Over 200 Visalia residents attended the grand opening and met Lorenzo Neal, retired NFL fullback and current host of the morning show at 95.7 The Game. Fans taking a picture with Lorenzo Neal, retired NFL fullback and current host of the morning show at 95.7 The Game. In addition to music, prizes and raffles, attendees had a chance to win $6,000 in cash by participating in the Money Machine sponsored by the Spanish TV Network Mexicanal where one participant walked away with $233. Note: The former Xfinity store on 1031 N. Plaza in Visalia is closed and is being replaced with this new, updated location.